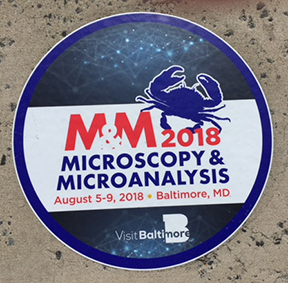 For years I have been attending the Denver X-ray conference (DXC) and it is hard when it coincides with the Microscopy and Microanalysis Conference (M&M) as it has a few times in the past several years. It is just difficult for me to accept that the overlap is not avoidable! My interests are twofold, marketing activities where my main responsibility lie, and technical sessions which still pique my curiosity and which are beneficial for future product development. In the past couple of years at M&M, it has been great to attend sessions devoted to the 50 year anniversaries of electron microscopy, technical evolution, and algorithms, where my colleagues have either been the subject of presentations or have given papers. I have had the fortune to meet and, in some cases, to reacquaint with some of the main contributors to the scientific advancement of electron microscopy. When the Dust of M&M Settles, It’s Time to Take Stock…. Shawn presents our 2nd Lunch & Learn session at M&M 2018. For an applications engineer, M&M is our biggest and most stressful event. Back to back demos while making sure everything is perfect to truly show off the best you can offer, with presentations and poster thrown in for good measure. There is no real time to reflect during the show, so as the dust settles, I always like to reflect on the year past and the one coming (in our world it seems as though the year really begins and ends in August). 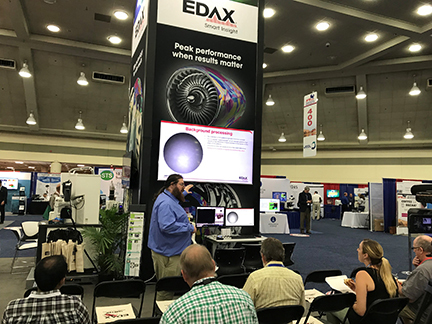 Over the past year, the EDAX EBSD world has seen major changes with the release of the Velocity™ detector. It was well received by our customers, which puts a smile on my face. Over the next year, you guys will have the system to play with and will really learn the power of it, showing that our hard work and time spent has really paid off. 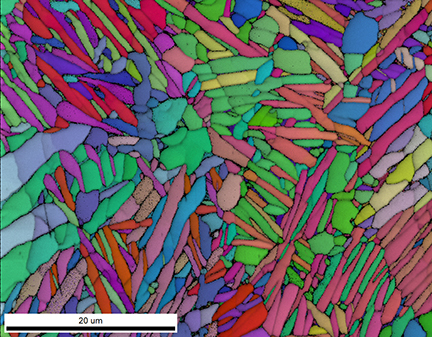 There is so much more in the works on the EBSD side that I wish I could tell you about. Stay tuned for that ride. It should be fun and exciting. As for the EDS world, the release of the Elite T was a great group effort with many small changes behind the scenes making big differences to the product, with more to come. That said, APEX™ still seems to steal the spotlight (sorry Matt!). With features being added quickly to each internal build, we see our customers’ needs being fulfilled one line of code at a time and in time, you will see them too. While hardware and software are key, I think that it is just as important to reflect on all the interactions we have at the show with all our customers, partners and friends. It helps me understand what we did right (and wrong) on our journey in the last year. Between workshops, onsite training sessions, and shows, I see customers both at their work sites, seeing what they are working with, and out at a neutral site learning from their colleagues about what’s new in tech or new ways to answer interesting questions. This helps us all to understand your needs and wants, and where we as a community are going and growing. With that in mind, I am turning this blog back over to you. 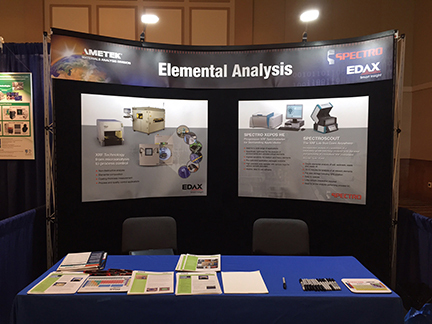 Where do you see microanalytical technology going in the next year? What application areas do you see expanding? What is the best way for us to disseminate information to you, our users? (webinars, videos, blogs, workshops?) We invite you to Leave a Reply via the link below. What Do You Do? and Whatever is Electron Backscatter Diffraction? Editor’s note: This blog was written in Chinese by Sophie, describing the challenges of explaining her work for EDAX to her friends and family in China. Please note that any linguistic clumsiness in the English version is the sole responsibility of the editor (and ‘Google translate’) and has nothing to do with Sophie’s original text! My family, friends and classmates often ask me, “what are you doing now?” – and I usually find it very difficult to give them an answer. Of course, different people need different answers. I once said the full name of EBSD to a bunch of my cousins, and then they looked at each other, completely astonished. They had heard every word clearly, but without the relevant background, they had absolutely no idea what I was talking about. I can explain at greater depth to my classmates and work partners, but even with there, I can sometimes see by the expression on the faces of some of the people that they simply don’t understand me. Since I have become an EBSD applications engineer, it seems that I often do EBSD education or promotion. I am determined to make my future work easier. The professional term used to describe this molecular arrangement within a material is anisotropy. 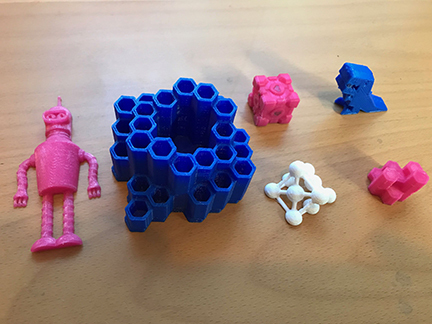 From a literal point of view, it can be understood that the performance of materials in different directions is different. This is a macroscopic performance. 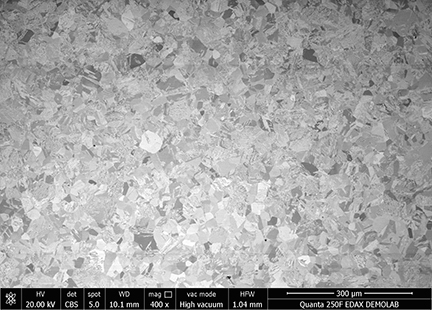 From the perspective of microstructure, it is due to the different orientation distribution of small structural units (here, crystal grains) of the material. If it is randomly distributed, it is isotropic, as shown in the left figure below. If it is not randomly distributed, but with a certain aspect of preference, as shown in the right picture, it is anisotropic. Another concept of texture, which refers to the distribution of orientation, can also be introduced here. 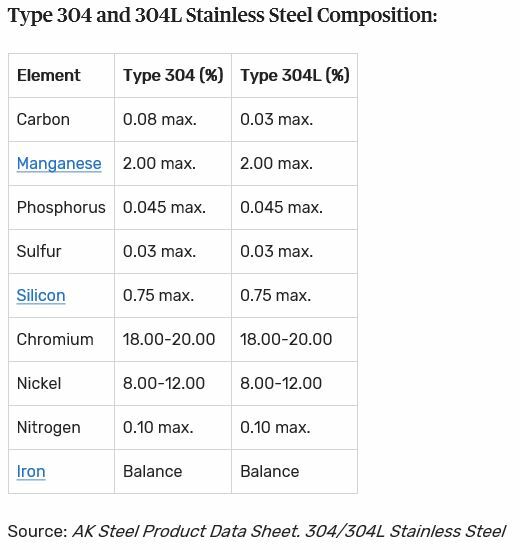 Texture is closely related to the material properties. 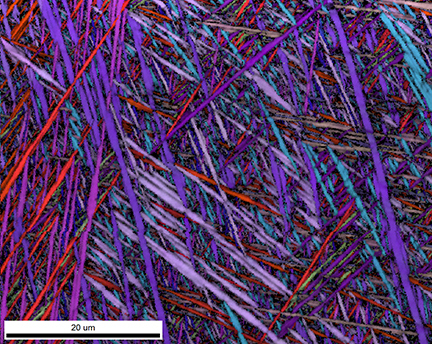 In fact, EBSD was invented and developed by a group of material scientists who were studying the texture of materials. At the international texture conference (ICOTOM), which is held every three years, various aspects of EBSD now provide about one-third of the total content. There are many tools available for measuring texture, such as X-ray diffraction, electron diffraction, neutron diffraction, EBSD. XRD measurement is convenient for a wide range of applications, but XRD is a statistical macroscopic orientation that does not give the orientation of each grain as shown in Figure 2. 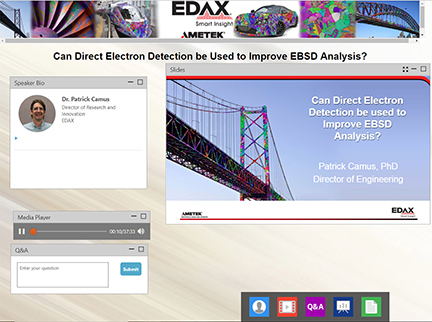 With neutron diffraction, you have to consider the cost and where to do it… so EBSD is popular. 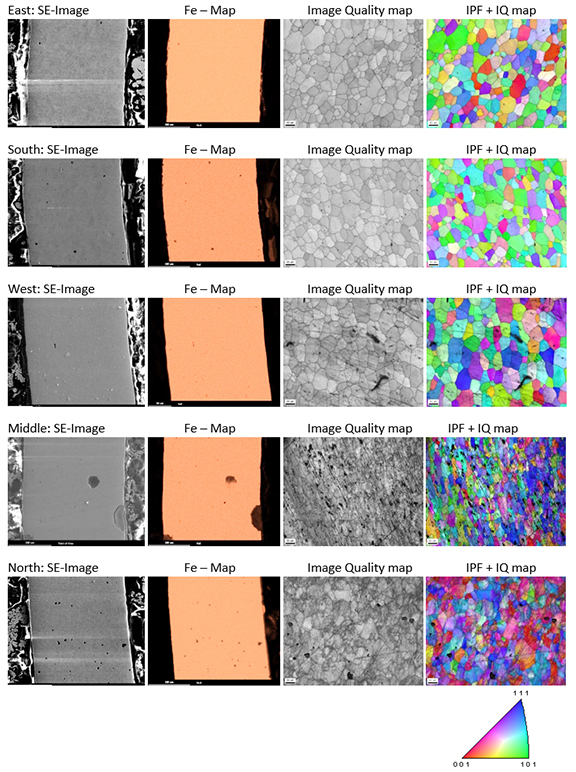 In the past two years, there has been an explosive growth in the study and use of EBSD in China. It seems that everyone is finally realizing that this analysis technique is less expensive, analysts can achieve excellent results, and these results are available more and more quickly. To say that the results are good, in fact, refers to the diversity of EBSD data analysis results. 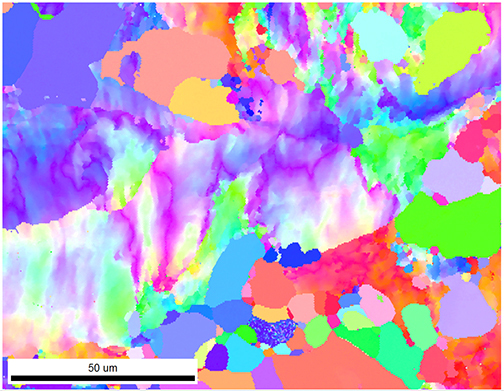 The first-hand data collected by EBSD is the orientation information of each point of the material. Through the processing of this first-hand data by special analysis software, the orientation distribution-texture information can be obtained, and the people who care about the material properties, especially the preferred orientation, get the information they need. Measurement points of similar orientations can be grouped together as grains if these points neighbor each other. Therefore, grain related information such as grain size and grain shape can be obtained. The orientation relationship between 2 neighboring grains can be described as a grain boundary. These boundaries can be colored by various properties such as misorientation, CSL, or phase. 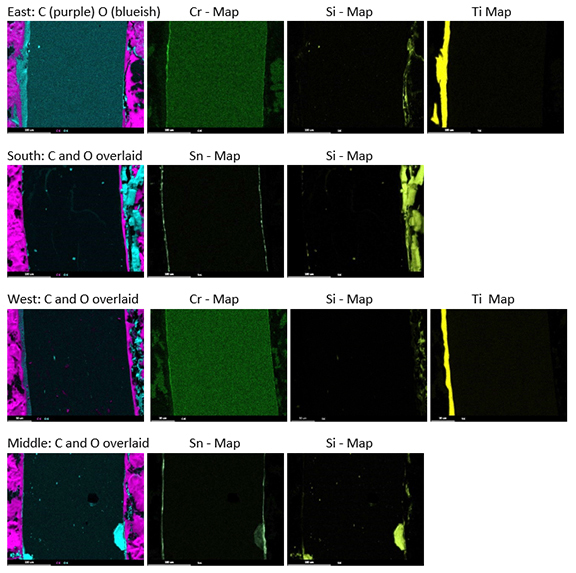 EBSD can also measure the effects of strain in a material, as this strain causes small changes of orientation within a grain that can be detected and mapped to show the deformed microstructure. 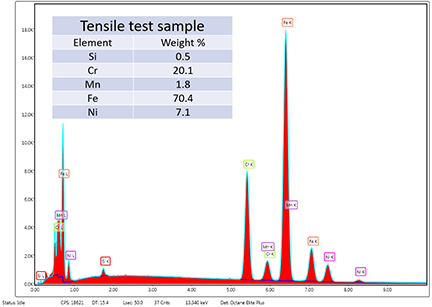 Through these graphs, we can optimize the process parameters, failure analysis, and cooperate with various sample stations to perform in-situ tensile analysis. 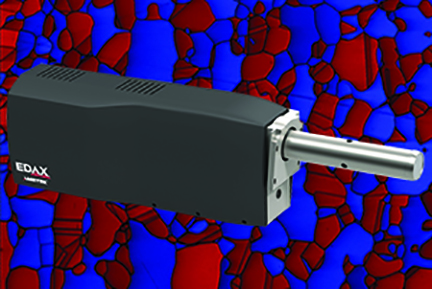 In-situ heating analysis, combined with other means to identify the phase. 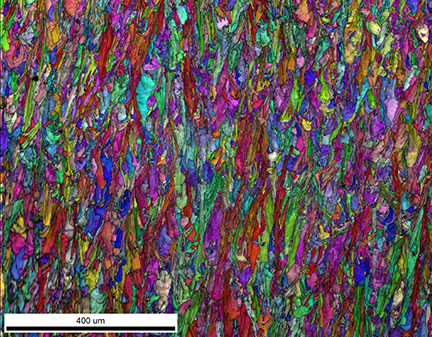 Finally, a beautiful orientation map is created: this is the most common EBSD result for everyone, that is, the orientation map represented by different colors. The daily work of engineering students is often boring, but we also have such beautiful colors! Vacationing Between a Rock and a Hard Place? Shawn Wallace, Applications Engineer, EDAX. One of the perks of both my degree (Geology) and my current job is that I have travelled extensively. In all those travels, I had been to 47 of the 48 contiguous US States, with Maine being the missing one. This year, I decided to be selfish and dragged the family to Maine on vacation, so I that could tick off the final one. Being a member of the Wallace family means vacation is a time for strenuous hikes and beating on rocks to unlock their inner goodies, to add to our ever growing rock and mineral collection. This vacation was no different. Maine is home to some of the best studied and known Pegmatites, and they quickly became our goal. Pegmatites are neat for a several reasons, the main two being that they tend to form giant crystals (a 19 foot long Beryl found in Maine) and weird minerals in general tend to form in them. I was able to track down some publicly accessible sites, found a lovely home base to rent for the week, and we set off for a week long rockhounding adventure. Ok not all week. We took a couple days off to go swimming, as it got up over 90F (>32C). Figure 1. 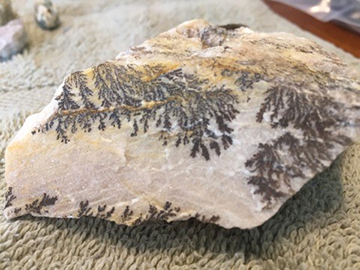 Dendrites cover this massive feldspar sample on nearly all faces. Our first stops yielded the usual kind of rocks I was expecting, but another site did not. There we found dendrites everywhere. The rock itself is a massive feldspar (Fig. 1). You can see that most of the dendrites nucleate at the edge of a fracture surface and then do their fractal thing on the surface itself. 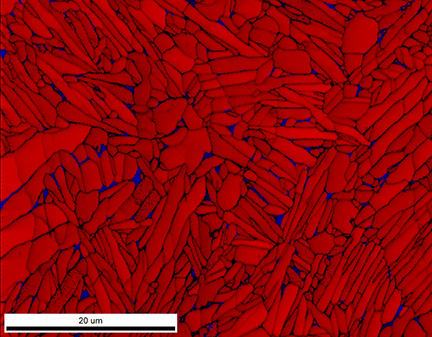 Wanting to better understand the sample, I started searching for previous EBSD work on geological dendrites. While a lot exists in the metals world, very little exists in the geological world. To me, this means I have work to do. Let’s see what I can do to get some useful data on this sample! 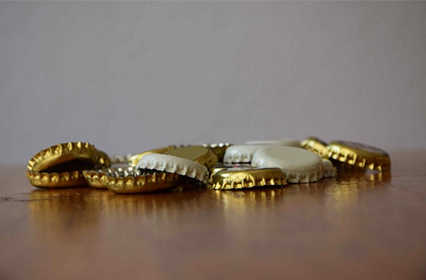 Crown Caps = Fresh Beer? A few days ago, I visited the Schlossgrabenfest in Darmstadt, the biggest downtown music festival in Hessen and even one of the biggest in Germany. Over one hundred bands and 12 DJs played all kinds of different music like Pop, Rock, Independent or House on six stages. This year the weather was perfect on all four days and a lot of people, celebrated a party together with well known, famous and unknown artists. A really remarkable fact is the free entrance. The only official fee is the annual plastic cup, which must be purchased once and is then used for any beverage you can buy in the festival area. During the festival my friend and I listened to the music and enjoyed the good food and drinks sold at different booths in the festival grounds. In this laid-back atmosphere we started discussing the taste of the different kinds of beer available at the festival and throughout Germany. Beer from one brewery always tastes the same but you can really tell the difference if you try beer from different breweries. In Germany, there are about 1500 breweries offering more than 5000 different types of beer. This means it would take 13.5 years if you intended to taste a different beer every single day. Generally, breweries and markets must guarantee that the taste of a beer is consistent and that it stays fresh for a certain time. In the Middle Ages a lot of people brewed their own beer and got sick due to bad ingredients. In 1516 the history of German beer started with the “Reinheitsgebot”, a regulation about the purity of beer. It says that only three ingredients, malt, water, and hops, may be used to make beer. This regulation must still be applied in German breweries. At first this sounds very unspectacular and boring, but over the years the process was refined to a great extent. Depending on the grade of barley roasting, the quantity of hops and the brewing temperature, a great variety of tastes can be achieved. In the early times the beer had to be drunk immediately or cooled in cold cellars with ice. To take beer with you some special container was invented to keep it drinkable for a few hours. Today beer is usually sold in recyclable glass bottles with a very tight cap keeping it fresh for months without cooling. This cap protects the beer from oxidation or getting sour. 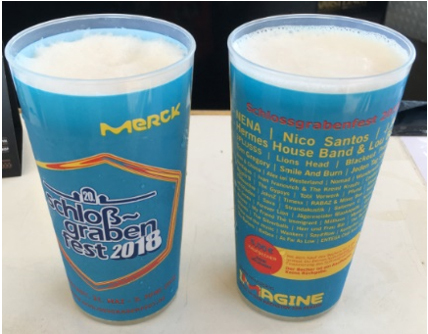 Coming back to our visit to the Schlossgrabenfest; in the course of our discussions about the taste of different kind of beer we wondered how the breweries guarantee that the taste of the beer will not be influenced by storage and transport. The main problem is to seal the bottles gas-tight. We were wondered about the material the caps on the bottles are made of and whether they are as different as the breweries and maybe even special to a certain brewery. I bought five bottles of beers from breweries located in the north, south, west, and east of Germany and one close to the EDAX office in Darmstadt. After opening the bottles, a cross section of the caps was investigated by EDS and EBSD. To do so , the caps were cut in the middle, embedded in a conductive resin and polished (thanks to René). The area of interest was the round area coming from the flat surface. The EDS maps were collected so that the outer side of the cap was always on the left side and the inner one on the right side of the image. 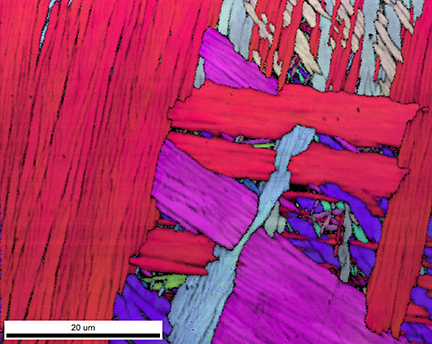 The EBSD scans were made from the inner Fe metal sheet. Let´s get back to our discussion about the differences between the caps from different breweries. The EDS spectra show that all of them are made from Fe with traces of Mn < 0.5 wt% and Cr, Ni at the detection limit. The first obvious difference is the number of pores. The cap from the east only contains a few, the cap from north the most and the cap from the middle big ones, which are also located on the surface of the metal sheet. The EBSD maps were collected from the centers of the caps and were indexed as ferrite. The grains of the cap from the middle are a little bit smaller and with a larger size distribution (10 to 100 microns) than the others, which are all about 100 microns. A remarkable misorientation is visible in some of the grains in the cap from the north. Now let´s have a look at the differences on the inside and outside of the caps. EDS element maps show carbon and oxygen containing layers on both sides of all the caps, probably for polymer coatings. Underneath, the cap from the east is coated with thin layers of Cr with different thicknesses on each side. On the inside a silicone-based sealing compound and on the outside a varnish containing Ti can also be detected. The cap from the south has protective coatings of Sn on both sides and a silicon sealing layer can also be found on the inside. The composition of the cap from the west is similar to the cap from the east but with the Cr layer only on the outside. The large pores in the cap from the middle are an interesting difference. 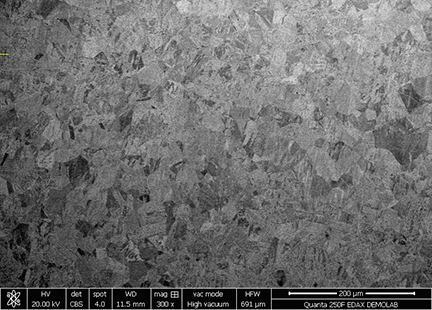 Within the Fe metal sheet, these pores are empty, but on both sides, they are filled with silicon-oxide. It seems that this silicon oxide filling is related to the production process, because the pores are covered with the Sn containing protective layers. The cap from the north only contains a Cr layer on the inside. The varnish contains Ti and S.
In summary, we didn’t expect the caps would have these significant differences. Obviously, the differences on the outside are probably due to the different varnishes used for the individual labels from each of the breweries. However, we didn’t think that the composition and microstructure of the caps themselves would differ significantly from each other. This study is far from being complete and cannot be used as a basis for reliable conclusions. However, we had a lot of fun before and during this investigation and are now sure that the glass bottles can be sealed to keep beer fresh and guarantee a great variety of tastes.